« Day 206 in Beijing: Just Another Day At The Job. Day 207 in Beijing: I’m a Little Weird. One of the Petronas Twin Towers stands behind a row of houses that are falling apart. Okay, if you’ve been reading my blog, you already know that. However, this specific weirdness is in regards to architecture. I love modern architecture, when done well, and in the right arena. The De Young Museum, in San Francisco, is amazing. The Petronas Twin Towers are amazing. The Eiffel Tower is amazing. However, these are pretty obvious to most people and I don’t think I’m going out on a limb stating that these buildings are amazing. What I do find amazing, and this is where you might find me weird, is I like the destruction of architecture. I love when Nature has its way and takes its toll on what we humans think will be indestructible. I don’t mean that I enjoy when people die from structures collapsing, but I love collapsing structures. When that centre can not hold, it brings with it the beauty of destruction, confusion and rebirth. Without one, there can not be the other. 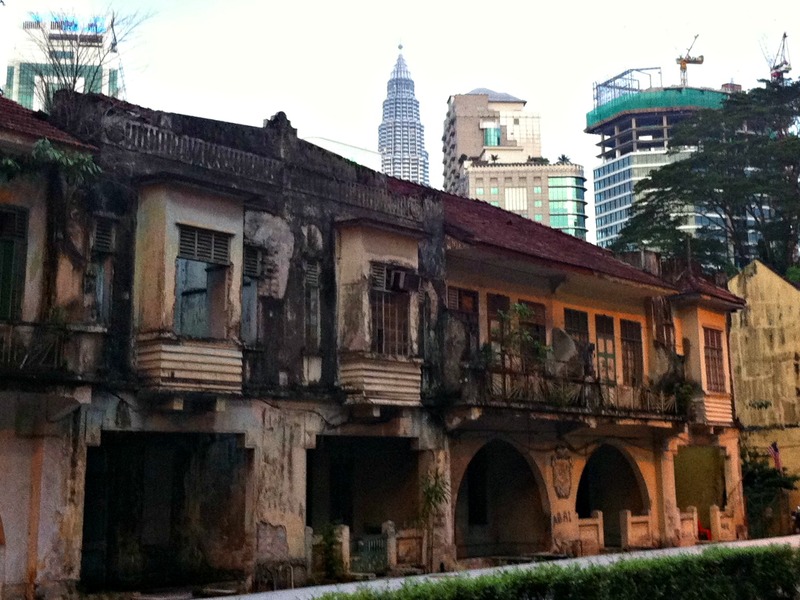 As I travel around Kuala Lumpur, there are many buildings that are fantastic and new, and many others that are dying and waiting to be reborn into something entirely different.